This weekend The British Classic and British Open has taken place at Bridlington. A lot of North East players had made the journey to compete, with good results from many players. In the British Classic yesterday, Simon Tate, Scott Mcparlin and Glen Durrant made the last 32. Mcparlin was edged out in a decider to Matt Padgett whereas Tate and Durrant both lost out 4-1. Clevelands Barry Davies was in fantastic form reaching the last 8 stage. En route to the quarter finals he defeated Welshman, Wayne Warren and Andy ‘The Hammer’ Hamilton. 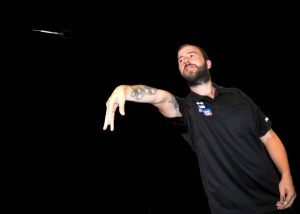 Carl ‘The Jackal’ Hamilton went the furthest, reaching the stage semi finals. The Darlington ace battled through to beat some very big names such as, Dave Copley, Gary Robson and James Hurrell en route to the last 16 stage. He defeated experienced players Nick Fulwell and Martin Phillips 4-3 to make the stage semis against Dutchman, Wesley Harms. Unfortunately, Carl ran out of steam and was defeated 5-1. A fantastic performance and a massive step in the right direction. In the ladies, AnnMarie Potts and Jennifer Summerson made the last 32 with AnnMarie losing out to eventual winner, Laura Turner. Durhams Linda Ithurralde and Kirsty Hutchinson both made the last 16. Linda was defeated 4-2 by Australian, Corrine Hammond and Kirsty was beaten by world champion, Lisa Ashton.